One-day Trip to Pyeongchang on the Gyeonggang Line! The Gyeonggang Line, a high-speed railway operating between Incheon and Gangneung, passing through Seoul and Pyeongchang, opened in December of last year. With this new line in place, visitors to the capital city can also easily enjoy day-trips to Gangwon-do! Hop aboard the Gyeonggang Line KTX to enjoy a day full of the beautiful scenery and setting of PyeongChang 2018! Sangwonsa Temple is a mountain temple located deep within the forests of Odaesan Mountain. The temple is connected to the more famous Woljeongsa Temple along an approximately 8km-long valley trail. 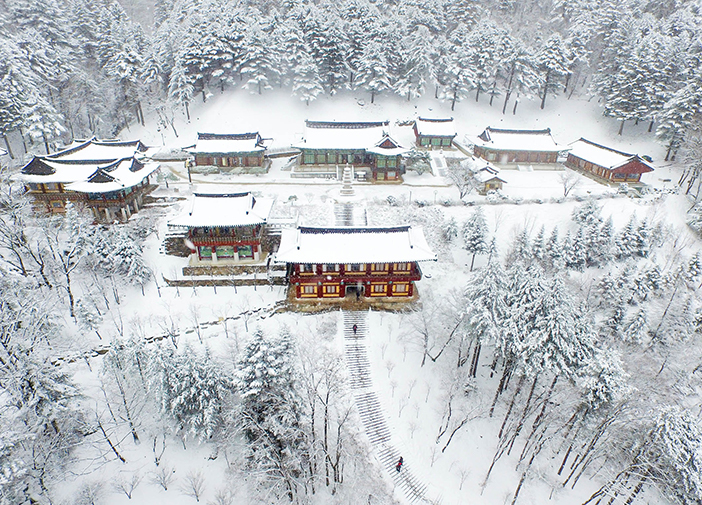 Due to the extra distance, Sangwonsa Temple retains a quiet ambiance throughout the year, felt most strongly during winter when the silence of snow covers everything. Sangwonsa Temple was built in 704, during the fourth year of Silla King Seongdeok, and is home to the oldest Buddhist temple bell in Korea, the Bronze Bell of Sangwonsa Temple. The ceiling above the temple entrance is painted with a beautiful image of the Manjusri Bodhisattva. The painting is said to bear hopes for all who view it to encounter good relationships. 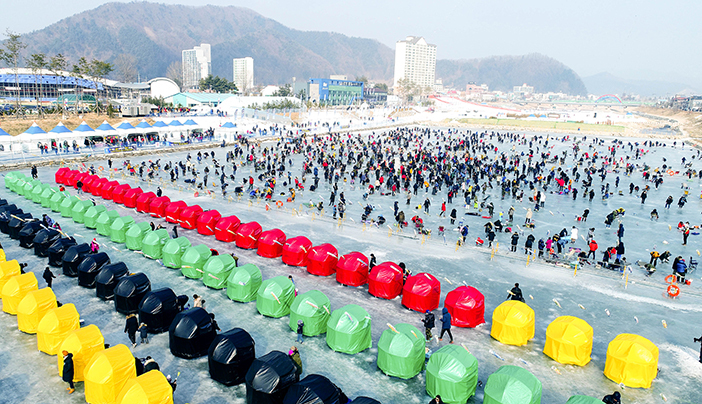 Pyeongchang Trout Festival is held every year in Pyeongchang during the depths of winter. This year’s festival is running from December 22, 2017 to February 25, 2018. The festival offers up exciting activities such as trout fishing and sledding, for an enjoyable winter experience. Embrace the cold at Pyeongchang Trout Festival through such activities as ice fishing, barehanded fishing, family fishing, sledding, ice sleds, bobsleighs, an ice train and more. The trout at the festival are mostly around 30 to 40cm long, and visitors are limited to two catches, increasing the chances of catching a fish for all. After you’ve caught your limit, take the fish to be grilled or served up as hoe (sliced raw fish). Surprisingly, the most popular activity is barehanded fishing. Participants dive into the freezing cold water in an attempt to catch a fish with just their hands. As you can imagine, the cold is shocking, but a successful catch of one of the slippery trout more than makes up for it! After enjoying the icy splendor of Pyeongchang Trout Festival, head to the hidden Café Elim to warm up. Located near the festival grounds, at the end of Odaecheon Stream, Café Elim has become quite popular by word-of-mouth, especially for its tranquil view of the stream outside the windows. On weekends during the festival period, the café fills up with travelers looking for a light meal and some coffee. Your body will freeze while enjoying fishing in the knife-like winter winds around Odaecheon Stream, and a morning of fishing will make anyone hungry. If that’s the situation you find yourself in, head to Café Elim for treatment! The strong taste of the pour-over coffee will quickly melt your frozen body. 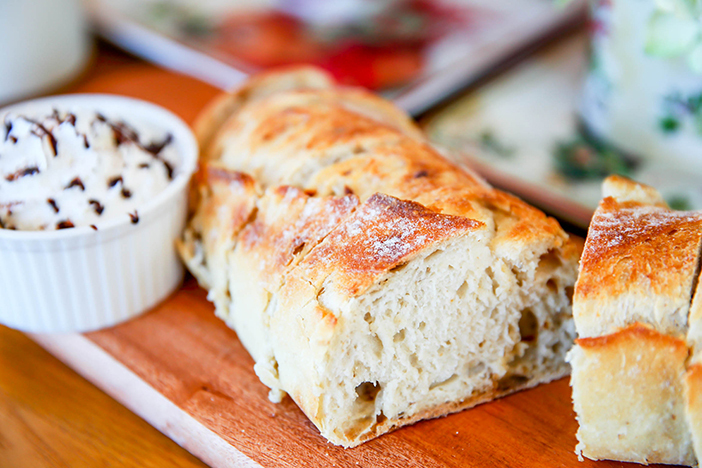 Try it with an order of freshly baked organic yeast bread and cream for an extra boost of energy. If you’re looking for something a little heavier, order the hamburger or brunch. They may seem quite simple, but they’ll do the trick. * This column was last updated in January 2018, and therefore information may differ from what is presented here. We advise you to check details before visiting.